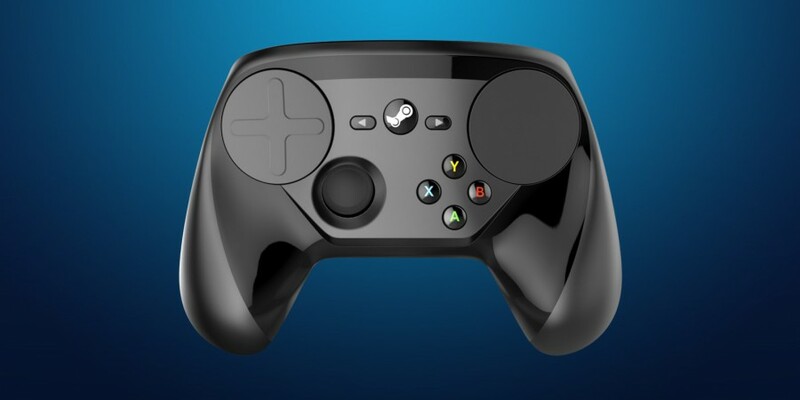 Pre-orders of the Steam Controller have been shipped out over the past few weeks and we received one. So here’s our thoughts on it. First look the packaging is really sleek, nice and inviting. Along with the controller you get two AA batteries, wireless adapter, USB to mini-USB wire and a dock for your wireless adapter. 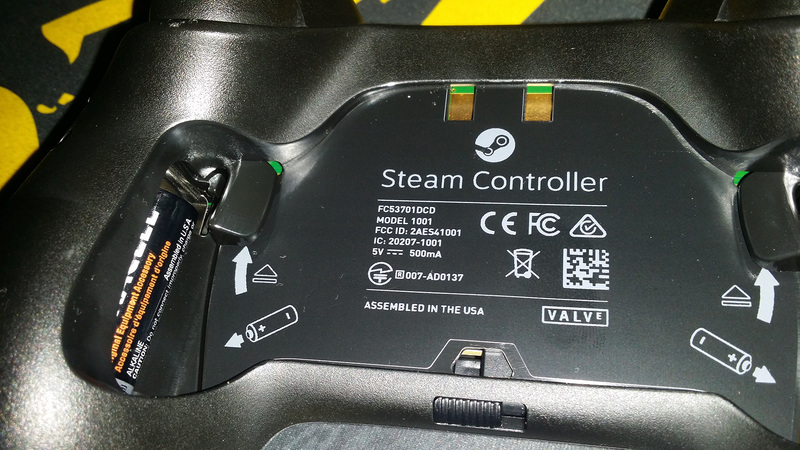 Very nice of Valve to include the batteries. It was really easy to set up, you simply plug in the batteries, the quick start guide helps show where the batteries go. And the way they slot in is very interesting. The back of the controller then slots back on and creates two buttons. Very cool. I really enjoy the amount of buttons and functionality you get with this controller. However, the touch pads at the top aren’t as good as I thought they would be. The one on the left instead of being a joystick style or XYBA pad is a D-pad which I rarely use on an xbox controller. I understand the buttons can be manually binded to different buttons, for example I could use the D-pad as a XYBA pad if I manually binded them, but who’s got time for that? Not me. The touch pad that allows you to move the mouse and click is really nice at moving the mouse, but clicking is hard or binded to one of the bumper buttons. I tried the controller in RocketLeague and none of the unique features of the Steam Controller worked, I had to use the joystick and XYBA pads the only thing I could use was one of the buttons on the back of the controller would change the view from ball view to free view. Check out this video by TheWarOwl on how to set up your controller properly by using community set ups. The controller worked a lot better in Cities Skyline where I could pretty easily play the game with the controller and not have any restrictions. The Steam Controller definitely works a lot better in the games that can’t be played with a controller already. I tried to use the Steam Controller for FIFA 16 but the controller wasn’t recognised by the game, I suspect because the game is on Origin, a Steam competitor. In my opinion the build quality feels a little plasticy, the Xbox One controllers definitely feel sturdier. The controller definitely takes some getting used to, if you’re switching from using an Xbox Controller you’re going to feel like the joystick and XYBA buttons aren’t in the right place but they definitely feel better over time. I’d still try and figure out a way to put these buttons in a more ergonomic position if I were Steam. The XYBA buttons are smaller than pretty much every other controller and if you can’t use the D-pad as a replacement to these buttons, playing platformers or other games that utilise the XYBA buttons won’t be as fun with a Steam controller as they would be with an Xbox controller. Another flaw in the Steam controller is that it constantly wants you to be in Steam Big Picture mode. Which I really dislike using while I’m on my PC. Valve, it’s nice that you think I’m on a Steam Machine but I don’t want to use Big Picture on my PC. The trackpad is nice, but it makes a sort of ripping noise when you use it. It’s oddly satisfying but can get annoying every time you swipe. "Overall I'm disappointed, the prototype looked like it had so much more potential. Valve have dropped the ball with this product and need to fix some pretty big issues. The XYBA buttons don't feel comfortable to use, the big D-pad trackpad isn't nice to use and feels useless, it's loud when you use the trackpad, and the build quality isn't the best."